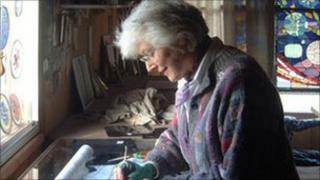 A Shropshire stained glass artist whose career nearly came to a premature end has written a book about her life. Jane Gray, who works in her riverbank studio at Shrawardine near Shrewsbury has works in churches, chapels and homes throughout the country. Two of her windows are in Shrewsbury Abbey and other examples are at St Oswald's Church in Oswestry and St Mary's in Chirk. She had feared her creative life was at an end when she had a stroke in 1996. Jane Gray began studying at the Royal College of Art in 1949 after which she became an assistant to the head of the stained glass department, Lawrence Lee. He celebrated his 100th birthday last year and has written the foreword for Mrs Gray's book, Playing with Rainbows. She moved to Shropshire 20 years ago and set up her studio at her home. In her kitchen hangs a small stained glass plaque which says "Another stroke of luck. Eh". It was made to mark her recovery from her stroke in 1996. She was unable to speak for some time, but she said that was not her biggest worry. "My first thought was that I'll never be able to do stained glass again and that was the most awful, awful thing," she said. "By the next day I was able... to do the alphabet... then I made myself a little match stick sort of daisy and I thought 'I can do it, I can draw'. That was such a relief," she added. One of her favourite commissions was a whole series of windows for St Peter's Church at Martindale in the Lake District in 1974. "The vicar had no stained glass in his church and one of his congregation said she'd like to have a memorial to her husband who had been drowned during the war," she said. The vicar was impressed with her first five windows and commissioned more. "He described my work as modern medieval, which I like," she added. Mrs Gray says she has no plans to stop working. "I don't need to retire, that's the marvellous thing. I've got my own studio... as long as I can see and have the use of my hands I want to go on," she said.